I'm dragging booty today. 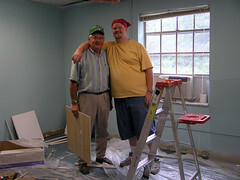 This week Jerry(my pastor) and I are remodeling the church secretary and the pastors office's at church. They are in serious need of renovation, and Becky(secretary) has a horrid color in her office. Jerry is an old hand and knows how to do just about anything. The project includes replacing all of the ceiling tile. This is not my favorite part because of all of the insulation, grit, dirt, dust, itching, coughing, sneezing, and hours spend on a latter working with my hands over my head. But that part is over. The other part of the remodel includes running all new phone and network lines, which I'm happy to say is completed. Now we move onto the drywall, painting, and construction part of the project. One week down and one more to go till we're done! I hope you'll post the end result of this "Trading Spaces" episode.